Rajam sir respected tradition and believed in fostering it. He was a creative artist and encouraged innovation within the traditional framework. He was a classicist and a great rasika of excellence in any form. As these are the very values Sruti stands for, it is no wonder that Rajam and Sruti got on so well. He was a 'Grand'-father for the Sruti parivaar. He was ever active and cheerful till his last breath. He was a unique gentleman who led a full life – in the service of music and the fine arts. He would spend hours at the Sruti editorial office at Alapana (which was also Pattabhi Raman's home) drinking tea, enjoying dosas, sharing his experiences with us, and explaining the nuances of music and painting. He would relate interesting first-hand anecdotes about musicians – peppered with humour, and analyse their music. Oh! he was amazing – a raconteur extraordinaire! He was Sruti's most reliable and authentic resource person, very objective in his analysis. He would never speak ill of anyone. He was deeply involved in all the projects conducted by the Sruti Foundation – on the music of GNB, Lalgudi Jayaraman, E. Krishna Iyer, on Carnatic and Hindustani music, to name a few. Rajam sir and Sruti's founder Editor N. Pattabhi Raman were very close friends. It was Rajam's “musical letter pad” with illustrations for Tyagaraja's kriti-s that brought them together. Pattabhi Raman was so impressed that he immediately enquired about the artist and drove down to 41 Nadu Street to meet him. That meeting laid the strong foundation for the steadfast friendship between S. Rajam and Pattabhi Raman, which lasted till Pattabhi Raman passed away in December 2002. It was also the beginning of Rajam sir's close association and collaboration with Sruti for almost 25 years till he passed away. Rajam sir was so upset when his friend Pattabhi died, that he himself had to be hospitalised soon after. And when my colleague and I called on him to wish him a speedy recovery, he implored us not to be disheartened; he advised us to be brave and carry forward his friend's vision. In fact, he was the first to suggest that we should have someone as knowledgeable and eminent as K.V. Ramanathan to steer Sruti through the difficult period, and even offered to persuade him if necessary. 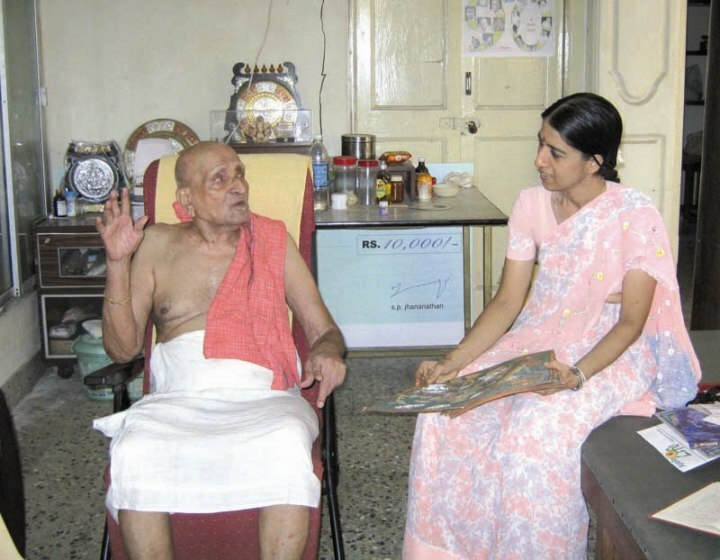 In the 1980s and 90s Rajam sir would visit Sruti very often. It was quite an amusing sight – a tall frame seated on a small moped, with a half-helmet on his head, wearing leather gloves with openings for his fingers. He would bring a rexin bag which he had designed and stitched himself. He was indeed a 'handy' man. He would spend hours with us discussing and explaining matters on music and art. He would not miss a birthday party, get-together or chamber concert at Alapana. Years later, when he was advised by the doctor to cut down his commuting, Pattabhi Raman, P.C. Jayaraman, Gayathri Sundaresan or I would visit him at Nadu Street and take notes. The steep, narrow steps that led up to his den were a gateway to scholarly pleasure. Every meeting with him was a revelation. In recent years, what we did very often was “dial Rajam to clear our doubts”! And he would readily explain to us whatever we wanted to know. This musician, music teacher, scholar and artist – all rolled into one, was indeed a walking encyclopedia. Rajam sir was probably the only person to combine music and painting so beautifully and seamlessly – one enriching the other. His illustrations and his classical style of painting with minute details and the layers of text and context he embedded in them – both literally and figuratively, were amazing. His Music Appreciation Notes published in Sruti – covering the 72 melakarta-s, janya raga-s, and over 70 raga-s were very popular. He reviewed books and audio recordings for Sruti under the penname 'Sundaram Bharadwaj' (S for Sundaram / Bharadwaja gotram!). He embellished others' writings too with his illustrations. His original paintings of the Saptaswara devata-s adorn the walls of our office at Cathedral Road. He was an invaluable member of the Sruti parivaar. Rajam sir was very happy when Sruti started serialising his melakarta calendar paintings in 2008. It was something very close to his heart. The next series of paintings we published with explanations was the panchalinga kriti-s of Muthuswami Dikshitar. We are now serialising Rajam sir's navagraha paintings. He has already given us notes for many of his musical paintings, and we will try to sustain his series as long as we can to the best of our ability in Sruti. Working with him was not only a learning experience, it was great fun. At Nadu Street he would at times ask me to search through his shelves for music notes, or climb on to a stool to locate his paintings stacked on top of the almirah! He would send his notes to Sruti written in small capital letters on small bits of paper like the triangular side of an envelope! He was a great one at making the best use of the paper available! Because he was so affectionate and simple we were not overawed by his greatness. We took liberties with him in the sense – we would go to his house without prior intimation, telephone him during siesta time, and badger him to give us his illustrations in time for the next issue. During the 10th anniversary celebrations of Sruti, Rajam sir presented a unique three-hour concert of padam-s he learnt from Mylapore Gowri Amma. As a good friend of mridanga vidwan Vellore Ramabhadran, Rajam was a regular speaker at the annual Vellore Gopalachariar Memorial award function organised by the Sruti Foundation. A self-effacing gentleman, he was taken by surprise when Sruti chose to honour him with the same award for his lifelong service to music. He was truly happy when we organised an exhibition of his paintings at the same venue. Similarly, when I wanted to do some Tanjavur paintings, he gave me pictures and told me: “Tanjavur painting is more of a craft. Remember you must make it an art – make it more artistic, be creative, use your imagination.” I followed his advice and he was delighted to know that one of my “artistic” Tanjavur paintings – as he called it, was printed on the cover of Tattvaloka. He gave me a box of Camel artists watercolours which I cherish to this day. The past two decades have been a memorable journey with Rajam sir, with many an unforgettable moment. Exactly a year ago, on 10th February 2009 the Sruti Parivaar marched into 41 Nadu Street. Loaded with a birthday cake, samosas, and tea, we celebrated the Grand Old Man's 90th birthday in style. We certainly gave him an unforgettable treat. But we too got a memorable treat in return when at 90 his voice rang out true and clear – he sang the Dikshitar kriti Sankaram Abhirami manoharam for us with gusto. We presented him with a special card and poster designed by us which said “S. Rajam – A Rare Gem.” He was delighted that we had played on his name and was visibly moved. Little did we realise that he would not be with us to celebrate his next birthday! Rajam was indeed a rare gem, a ratnakara, a Kala-nidhi, a karma yogi, ever willing to share of his vast knowledge without expecting anything in return. It is a pity he did not get the honours he deserved in music and painting. He was like the mighty ocean – with great depth of knowledge and like its ebullient waves, always raring to go – he was bubbling with ideas and activity! He is no longer there to greet us with a smile and his customary “namaste, namaste”. But this lofty man who believed in “Simple living and high thinking” has indeed left his indelible footprints on the sands of time. The February issue of Sruti is dedicated to the memory of S. Rajam.